It's hard to not be weather confused when September arrives to London. In the morning we get a very cold breeze and by noon it's sunny and it feels like late summer. So most of the time I end up wearing the wrong thing on the wrong day. But not to worry. 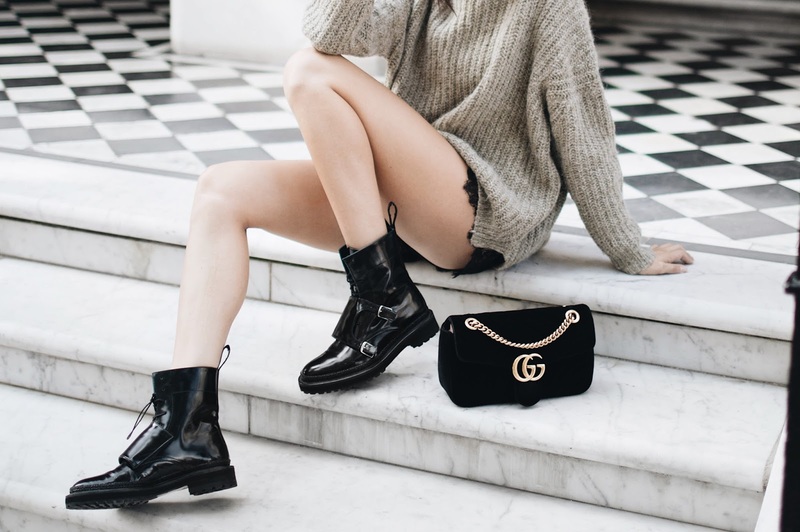 I tend to wear shorts,playsuits and skirts with sweaters (don't forget a t-shirt underneath) and then my favourites are sweater dresses with a pair of boots on these strange days. I absolutely love this outfit. An old Zara jumper (It might be from a charity shop, I stole it from my sister). And then a h&m jumpsuit with a black pair of boots. Now let's talk about the boots. Since I posted these pictures I've had so many people asking me about Inch2 shoes. They're a Latvian brand specialising in the most stunning handmade leather shoes. But there is a big BUT. Most of them seem very uncomfortable, the reviews are very mixed and people don't know what to believe. I have two pairs. One is a summer shoe, which is pretty comfortable and I can wear it without wanting to die for the day. But these boots in my pictures are the real killers. The first time I wore them - 6 blisters in 15mins. That was a record for me haha. But I put them on again a few weeks ago and they seemed better. And then after wearing them for a bit, they seem even better now. So maybe I just have to break them up and soften the leather a little. This is not an ideal situation because when you spend over €200 on a pair of shoes, you don't want to spend any time 'playing' with them to make them wearable. So I don't know, you will have to give me a little more time to see what I fully think about them. I also think they sadly might be too big for my skinny legs. Love this jumpsuit! Wish I was your size 😂 so I could strale it from u!